The mirrors and shower door were installed on day 65, with little effort. 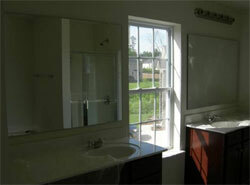 Each sink gets a large, single pane mirror mounted to the wall. Several more ornate options with elaborate frames or shapes can be put in place of a standard mirror with little effort. The shower door is a simple brushed frame with a magnetic latch shatter-resistant glass. There are also several options for shower glass including frosted or patterned glass to meet your preferences. If your space is small and you want to make it look bigger, strategically placed mirrors can do that job. If you plan to do the job yourself you have to know how to hang a mirror, where you should hang it and what materials you are going to use to hang the mirror. You would not want to end up having shards of broken mirror on your floor, so read on to know how to hang a mirror on the wall properly. First, you should know the size of your mirror. Measure the area of your mirror to know how much space it will occupy. Then, locate walls in your house where it can fit and where its presence will increase the lighting in that particular part of your house. To make your job easier, trace the perimeter of your mirror against a sheet of paper, then cut out what you traced. Use that paper cut out to check places where your mirror can fit. Bring along a smaller mirror to see how much light will be reflected if you place a mirror against a certain wall. Make sure the part of the wall you are considering is at eye level. Also, make sure that there are no electrical wirings near or beneath the wall you're considering as the location. Check for how hard the wall is so you know what tools to use. Once you have found a good location, stick your paper cut out there, then use a pencil to trace around its edges. If you are planning to hang a mirror against a wall that is not made of hard material and can easily be penetrated by a nail, trace your fingers along it or tap into it to look for studs. You can also use a stud finder if you have one. Once you find a stud, you have found a place where a nail can be hammered. Hammer a nail there and make sure the nail is sturdy, then hang your mirror. If the area of the wall where there are studs is below or above eye-level, you can still hang your mirror where you wish. Hammer a nail against where you want your mirror to hang. Then, get a plastic anchor or wall plug to put into the hole. You can get this item from a hardware store. Wall plugs usually come in different colors and look like tiny tubes. Insert a screw into the plug and leave enough space for it to stick out. Then, hang your mirror on the screw. If your mirror is too big for one screw to carry, drill another hole, insert a wall plug then drive in another screw. If you are hanging a mirror on a brick or similarly hard wall, do not attempt hammering a nail against it unless you want to end up with a broken fingernail. The only way to make a hole in a wall that is made of material as hard as brick is to drill through it. Make sure you do not drill anywhere near electric wirings, though. After drilling a hole, insert a wall plug or a metal anchor if your mirror is a little heavy. Then drive a screw into the wall plug or anchor. Make sure that the screw you use is tightly placed and big enough to carry your mirror. The above are instructions for hanging mirrors that have frames. If you have a frameless mirror, you can follow the above steps, except, instead of inserting screws, nails, wall plugs or anchors, you have the extra task of screwing in four mirror brackets-- one for each corner of your frameless mirror. You have to screw the lower brackets first then insert your mirror into the brackets, then screw the upper brackets. If you follow the instructions listed, you will find success in hanging a mirror. It would be wise to make sure you have all the necessary tools and materials needed before you begin the job. You may also need an extra set of hands, especially if the mirror is large. If you take your time, measure properly, use the correct tools and carefully situate the mirror where you want it, you should be satisfied with your work.